Patrolman Albert B. Sallee, Jr.
Patrolman Raymond Stetson Oyler, Jr.
Patrolman Cosby H. Whitted, Jr.
Patrolman Orville C. Trinkle, Jr. Officer Walter Davis Mazzie, Jr. 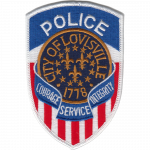 The Louisville Police Department has been absorbed by or is a component of the following.